Participate in one of Rab’s longest running tournaments! $1,200 First Place Prize Guaranteed! 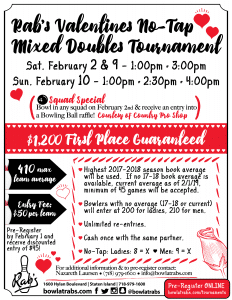 Pre-Register by February 1 and receive a discounted entry of $45 per team! Contact Nazareth Laursen for additional information, (718) 979-1600. Pre-Registration is closed for this event. Walk-in entries accepted if space permits.